Elizabeth married William Goodwin at an early age in Riverside, California. They were blessed with six children: Bernice, Bennett, Gilbert, Georgia, Lilla and Hirim. 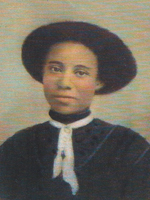 Georgia, the only surviving sibling, graciously donated their mother’s burial site for the monument constructed to honor the Riverside African Americans buried at Evergreen.